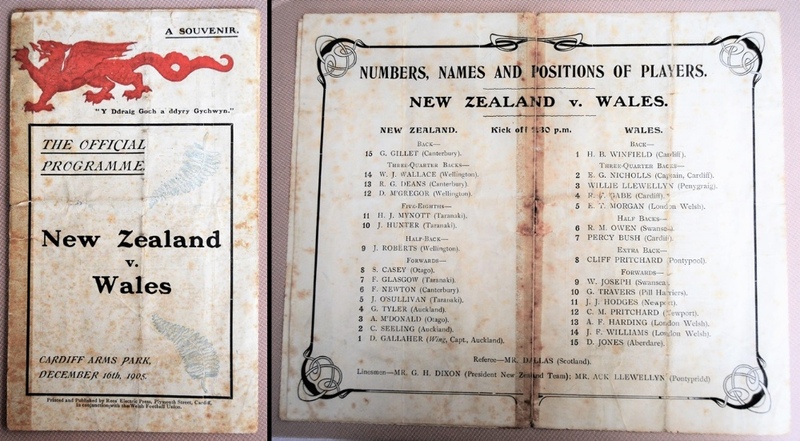 Very Rare 1905 Wales v New Zealand All Blacks Official Rugby Programme: To many the 'Holy Grail' of programme collecting, the famous official 8 pp Red Dragon and Silver Fern-cover issue for the 3-0 Wales win at Cardiff on 16th December 1905, which was to be the only defeat suffered by Dave Gallaher's Original All Black tourists. 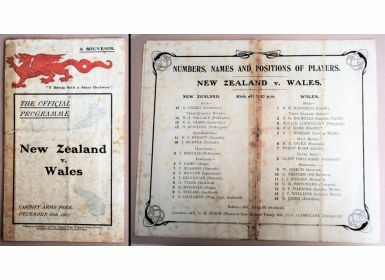 Teddy Morgan's try stood, Bob Deans 'try' did not, and the rest is history (plus an awful lot of New Zealand wins since). With the frequently found split spines formerly taped, some foxing and old folds, but still a very acceptable copy with no other loss and all thoroughly clear and legible. Almost 115 years old.